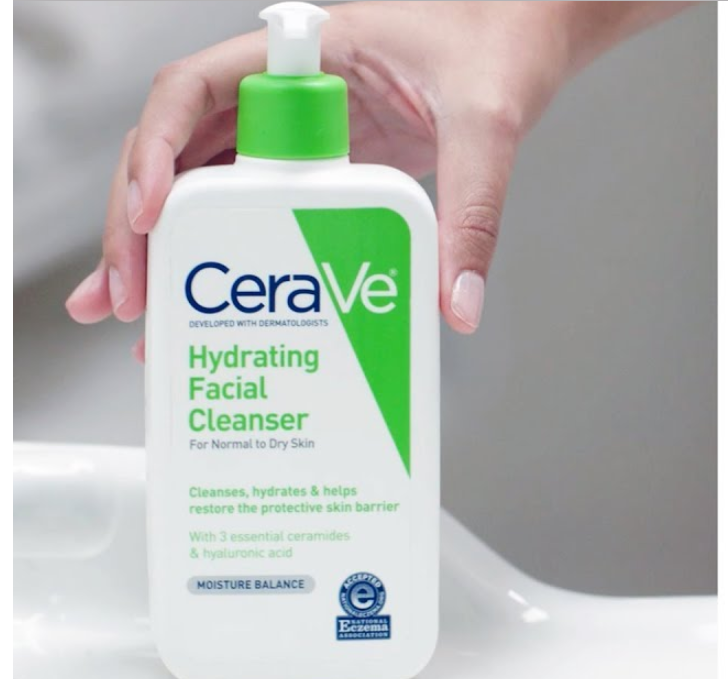 CeraVe Hydrating Facial Cleanser is a gentle cleanser that reminds me of Whole Foods 365 Everyday Value Gentle Skin Cleanser, another favorite of mine. It doesn’t lather, and it contains many of the same ingredients as CeraVe Daily Moisturizing Lotion. It also feels quite similar to that lotion in texture, except a little runnier. In this post, I’ll share my thoughts on why I like this cleanser, what not to expect from this cleanser, and we’ll take a look at how much its ingredient list actually overlaps with CeraVe Daily Moisturizing Lotions. Many of the ingredients in CeraVe Hydrating Facial Cleanser actually sound hydrating enough to actually belong in a moisturizer: ceramides, hyaluronic acid, phytosphingosine, cholesterol, glycerin. It sounds a little counterintuitive to include these high-quality ingredients in a product that you’re going to rinse off. But at least you know that any remaining residue is likely to be gentler and less irritating than a foaming cleanser. I like this cleanser quite a bit. I don’t think it’s noticeably different than the Whole Foods 365 Everyday Value Gentle Skin Cleanser, and despite its moisturizing ingredients, I don’t know if it actually lends any noticeable moisturizing benefits for your skin. This cleanser feels pretty gentle and doesn’t contain any fragrances. However, it does contain fatty alcohols, specifically stearyl alcohol and Cetearyl alcohol so it may aggravate certain skin types. This product is accepted by the National Eczema Association, but that website shows a different ingredient list. It looks pretty much the same, except the version on the National Eczema Association website has been sorted in alphabetical order, and replaces the parabens with phenoxyethanol, another type of preservative. I like that this cleanser is so gentle that I feel like I’m rubbing lotion on my face, almost like a pre-moisturizing step before I actually moisturize. Perhaps it’s similar to those wet skin moisturizers I’ve seen on the market. To me, it works well as the first step in a series of skincare products that help moisturize and pamper my skin.